Football runs deep in many families. Parents are often guilty of encouraging their children to follow the family club. The family dynamic often revolves around football. 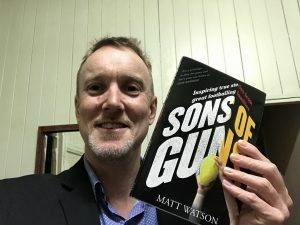 When Ali Watts from Penguin Random House offered me the chance to write Sons of Guns, I wrote a proposal about football and family. My grandfather, Pa, played football in country leagues throughout Victoria. In team photos, Pa stands in a dark woollen jumper, biceps like bluestones, huge chest, square jaw and eyes set to stun. Pa worked in flour mills and drove trucks and followed Richmond. My father, Bill, never played football at any level. He shunned family loyalty and followed Footscray. In 1977, I was six, with a plastic footy, no skills and no team. My life changed moments before I made my debut for Oak Park under 9s. Oak Park wore North Melbourne jumpers. The moment that jumper slipped down my body, I was hooked, instant love for North Melbourne. I can still recall that feeling in the change rooms, waiting to play, thinking I was playing for North Melbourne. Like Bill, I bucked family tradition. Later that year, when North Melbourne defeated Collingwood in the grand final, my juvenile brain thought North would win grand finals forever. In 1978, Bill took me to Arden Street for my first game of football. Up against Footscray, North Melbourne trailed all day. It rained. Footscray won by 30-points. Bill offered soothing words, they’ll win next week. After the game, he never mentioned his support for Footscray again. By 1979, Bill supported North Melbourne. My love for the Kangaroos spilled over to my sisters, brother and mother. North Melbourne helped bond the family together, as they have done ever since. I sent Ali a proposal. Sons of Guns would be about family, how it felt to have a father who played VFL/AFL football, the pressure and expectation it created. If it impacted on junior careers. I hoped to learn how the fathers felt when their boys play junior football. If they coached junior football. Did they find it difficult staying in the background? Did they ever think their boy wasn’t going to make it? I was after memories, recollections, first games, success, failure and injury. The footballers told me that and more. Ken Fletcher talked about his father, a solider in World War Two. Describing himself as an average player, Ken still rues the best-and-fairest he lost because he missed two home and away matches while playing for Victoria. Dustin remembers tearing around Windy Hill as a kid and playing just one year of junior football. At 16, he had to choose between football and tennis. He recalled 14 operations and downplayed his best-and-fairest award in a premiership year. David Cloke disclosed unsanctioned injections into his foot so he could play in a grand final. He described the difficulty of leaving Richmond and joked about his final year of football, aged 36, which was one of his best. His boys, Jason, Cameron and Travis told stories about their tennis court, competitive backyard games, playing football in the snow and playing for the most famous club in Australia. Ray Shaw talked about captaining Collingwood, winning a Copeland Trophy and getting over grand final losses. He kept scrapbooks his boys, Rhyce and Heath, poured over. Rhyce and Heath recalled premiership wins and defeats, the disappointment of leaving Collingwood and finding success at new clubs. Brian Cordy’s cursed nine knee operations but his career extended long past Footscray. An early advocate for a girls’ competition, Brian helped set up a girls team at a Geelong school. Ayce described the despair of four shoulder reconstructions but still left the Western Bulldogs in love with football. Zaine, already with one shoulder reconstruction, talked about the premiership he won in his 11th game of football. Jack Hawkins talked about playing on the VFL’s best forwards. He mentioned a warning he ignored about being third up in ruck contests, and paying the price. A knee injury cut Jack’s career short, so he went back to where it all started. His son, Tom, is a power forward, playing on the best defenders. Tom discussed changes in the game that made football harder for forwards. Jack wore number 26 for Geelong, the same number Tom wears. Dean Rice was open about being delisted by St Kilda, because of fears about his reconstructed knee. In his first game for Carlton, Dean wrecked the same knee, but rebounded to play in a premiership. Bailey, his son, chose St Kilda over Carlton and detailed injuries in his first two seasons. Bailey made his debut in 2018 wearing 37, the same number his father wore. Graham Cornes talked about the restlessness he felt after serving in the Vietnam War. Two days after returning from combat, he played for Glenelg’s reserves. Graham had a club to come back to. As his sons, Chad and Kane, grew up, they had clubs to go to, where their father was playing and coaching. Graham discussed the feud between Victoria and South Australia, his stint with North Melbourne and coaching Adelaide. His boys carried their father’s mentality – Port Adelaide against the rest, and they forged their own legends. Barry Mitchell was a fly-in-fly-out Sydney Swan for the first two years of his career. When he shifted to Sydney, he flew on the field. Barry is humble about his career, and he played in six finals without a win. He remains frustrated that injury ended his career in a premiership year. His son, Tom, went to Sydney as a father-son selection. He discussed the reasons behind his decision to return to Victoria. Tom wanted more opportunity at Hawthorn. He is getting it. As I wrote, two things impacted on me. Most of the sons were bullied, abused and taunted because of their famous surname. They copped it at school and on the field. Things kids shouldn’t have to put up with. And the analysis of injury, medical rooms, hospitals and operations was disturbing. Injury doesn’t discriminate. In football, it is inevitable, and it ruins careers. Through the benefit of age, I watched all the fathers play VFL football. I have watched their sons play. I knew about their careers, but I didn’t know how it all happened. I want to thank the Sons and Guns for investing their time and enthusiasm in the book and for telling me how it all happened. Without their memories, the book wouldn’t have happened. Thanks to Adam McNicol for introducing me to Ali Watts. Thanks to John Harms for your encouragement and help. 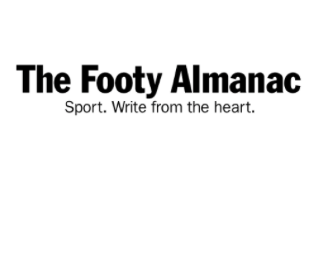 Thanks to all at the Footy Almanac community. Thanks also to Ross Abbey, Heath O’Loughlin, Hannah Greasley, Nicole Maloney, Bill Meaklim, Clair White and Natalie McGregor. Special thanks to Ali Watts, Johannes Jakob, Emily Cook and all at Penguin Random House. If it wasn’t for Ali, this book would never have been written. Each interview was recorded on iPad, with my phone on speaker then transferred to computer. Compiling questions in chronological order provides an instant advantage, because football books are best written chronologically. It means less words need moving. Transcribing is toil. I don’t hate it, but it is a slow process. A 40-minute interview can take about two hours to transcribe. A friend, Nancy, transcribed half of the 23 interviews. I cannot thank her enough. The raw interviews were copied into a new document. That way, the raw interview remains unaltered and preserved. The copy becomes the working document, where the words take shape. It takes about 20 hours to get a 40-minute interview into readable form, with stats and historical information. Putting a chapter together, from two interviews, takes about twenty hours. The first draft of a chapter, including transcribing, can take about 45 hours. The draft has to be printed and edited on the page with a blue or red pen. Mistakes are picked up easier from paper than the screen. Some chapters underwent eight ruthless edits, culling about 2000 words, before being sent to Ali. Ray Shaw was the first interview in late November, 2017. At least six nights a week, I worked on Sons of Guns, usually two or more hours each night. For almost six months, I was a hermit. By late April, the book was finished. Then came another edit, the manuscript back and forth in the mail. Photo captions were next, then a final edit. The process, thanks to all at Penguin Random House, was seamless. When I was at university, Professor Lee Duffield plotted my course to graduation. He asked my ambition then frowned, cautioning me about writing sport books. ‘Friends of mine have written biographies and other sport books,’ he said. ‘It will take you a year. You’ll make no money and at the end of it you won’t want to do another.’ He smiled like he’d convinced me. Lee’s blunt assessment about writing didn’t dull my enthusiasm, but he was right. Writing a book is hard. It takes months, an understanding publisher (that’s you Ali), hours of research and a reptilian brain, always moving forward. Footballers can be hard to contact and lock in for an interview. Some don’t want to be interviewed. As phone calls went unanswered, as I kept calling back, there were moments of panic, missed deadlines and frustration when the words wouldn’t move. As each word was written, moved or deleted, it was one more word towards the end. If you’re motivated, if you want to write, don’t fear the blank screen. Don’t fear the words. Don’t fear the idea. Too many football books are yet to be written. Make an opportunity and take it. Reach out to clubs for contacts. Do the interviews. Make time. Make it happen. Sons of Guns is a book about family and football. Matt Watson’s new book Sons of Guns is a look at some famous footballers and their equally famous footballing fathers. Matt will be a guest speaker at an upcoming Almanac/Odd Friday Lunch at the North Fitzroy Arms – more details here. Thanks for sharing those thoughts at the end.